The Norilsk Nickel series ships are the world’s first container ships built to Arc7 class standards. Source: Press Photo. Norilsk Nickel’s fleet carries copper and nickel but it’s also a vital link to the outside world for an isolated Siberian mining community. Once every two days, one of the enormous diesel-electric ships owned by Norilsk Nickel leaves Murmansk for the mouth of the Yenisei, Siberia’s biggest river. After five to seven days of breaking through thick ice, ships will call at the port of Dudinka, bringing supplies to the Norilsk mining region, which has large deposits of nickel, copper and precious metals. “These ships were the first of their kind in the Russian fleet and no other fleet had them. In Hamburg, two German customs officers boarded the ship – the one that entered on duty and the one that handed over. They were very excited to see it and asked me to give them a tour"
It is hard to get to Norilsk from other Russian regions as it has no road and rail connections to speak of. The only way to get there is by plane, by sea or by the Yenisei. The population there relies on the Norilsk Nickel ships for the 4,000 to 8,000 tons of groceries and household supplies it brings to them. The ship then transports commodities – such as Monchegorsk nickel and copper smelter – to the domestic and foreign markets, including the Kola Peninsula in the far north-west of Russia. Meanwhile, the ships are also fulfilling one of Russia’s priority tasks by transporting freight by the Northern Sea Route as part of the campaign to explore the Arctic. Norilsk Nickel ordered its first Arctic-class vessel in 2006 from the Finnish shipbuilding firm Aker Yards. The new ship completed all Arctic trials, after which four more diesel-electric ships with a capacity of 14,500 tons and an Arctic tanker were ordered from a German shipyard. Mikhail Khomenko, captain of the Talnakh diesel-electric ship, is a deep-sea master who has spent 13 years working on the ice-breaker fleet. His pride is obvious as he shows me around the Talnakh and explains that these ships attract a lot of attention as there are so few of them in the world. The company was founded in 1935 by the Soviet government as Norilsk Combine and was controlled by the NKVD, the secret police, who used forced labour from the Gulag. In the Nineties, it was privatised and became Norilsk Nickel. In 2007 it began acquiring assets abroad and now has production facilities in three continents. The company is the world’s largest producer of nickel and palladium and a leading producer of platinum and copper. It prospects, explores, extracts, refines, produces and markets metals. Its main assets are the sulphidic fields of Talnakhsky and reserves of nickel and copper ores the sulphidic fields of Talnakhsky and reserves of nickel and copper ores behind a polar circle on the Taymyrsky peninsula. Captain Khomenko has every reason to feel proud. The Norilsk Nickel series ships are the world’s first container ships built to Arc7 class standards. The ship is capable of breaking through 1.5 metres (5ft) of ice at a rate of 1-2 knots, without the support of an ice-breaker. It is also the first Russian ship equipped with the Azipod propulsion device, which consists of a power plant mounted outside the hull which can rotate 360 degrees, increasing the manoeuvring capability of the ship in both its course and speed. When it’s in ice-congested waters, the Talnakh can turn stern first to break the ice. Also, the Azipod system requires a smaller power compartment, thus maximising the ship’s cargo capacity. On its journey, it stops neither in the Kara Strait nor in the mouth of the Yenisei, where the ice is almost always very hard. According to Oleg Fedin, director of the Murmansk transport subsidiary of Norilsk Nickel, the Arctic express ships run to a tight schedule, taking five to seven days to complete their journey from Murmansk to Dudinka in winter. The cabin has state-of-the-art navigation equipment and automated safety systems. Capt Khomenko explains that when sailing in icebound waters, he receives real-time satellite images of the ice situation in the navigation area, and these are automatically integrated into the navigational charts. “My objective is not to break the thickest ice to prove that I operate the most powerful vessel in the Arctic, but rather to use navigation information to reach point B from point A via the shortest route and using the minimum of fuel,” he says. Norilsk Nickel’s fleet of vessels runs between Dudinka, Murmansk, Arkhangelsk, Rotterdam, Hamburg and Shanghai. Because the ships do not need to be accompanied by ice-breakers, they have slashed delivery costs by 30pc. 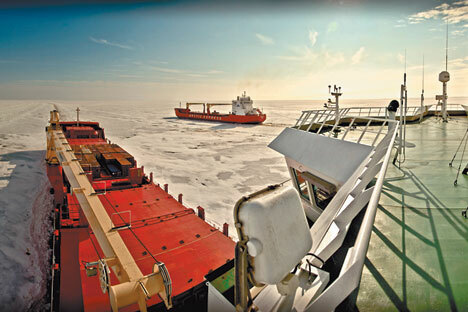 The annual freight turnover of the company’s maritime fleet operating on the Northern Sea Route is estimated to be around 1.3 million tons, which includes 0.45 million tons of metal products mined by the Norilsk Nickel company. The Northern Sea Route is the shortest passage between northern Europe and the Asia-Pacific region. The entire route lies in Arctic waters and parts of the route are free of ice for only two months each year. It is an established national transport artery. In the early Thirties it was used to connect the European and Far Eastern parts of the country. The route is a potential alternative to traditional international seaways in terms of freight costs, safety and quality. In recent years, the volume of Arctic freight traffic has greatly increased.